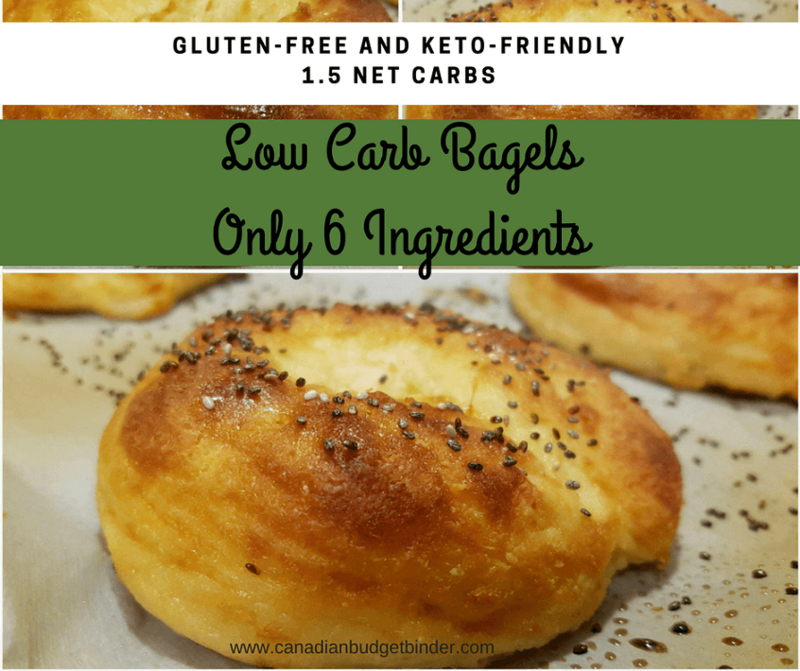 You won’t believe that there are ONLY 6 ingredients in these low carb bagels which by the way are also gluten-free and keto-friendly with 1.5 net carbs each. Every low carb kitchen with a keto stocked pantry will already have these few ingredients so that making this recipe is even easier. If not, stock up because you’ll need all the wonderful products that bring keto recipes together along with plenty or protein and vegetables. 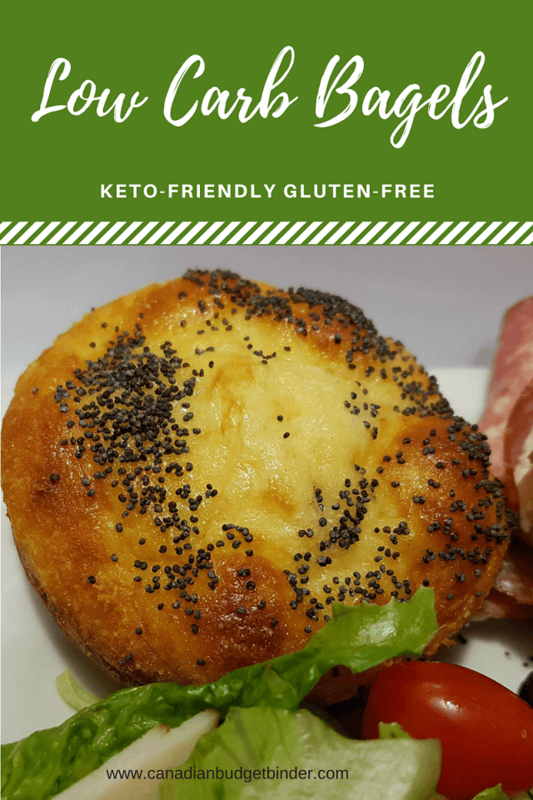 If you’ve wanted to satisfy that bread craving you’ve had but without all the carbs you won’t want to miss this recipe for gourmet keto low carb bagels. 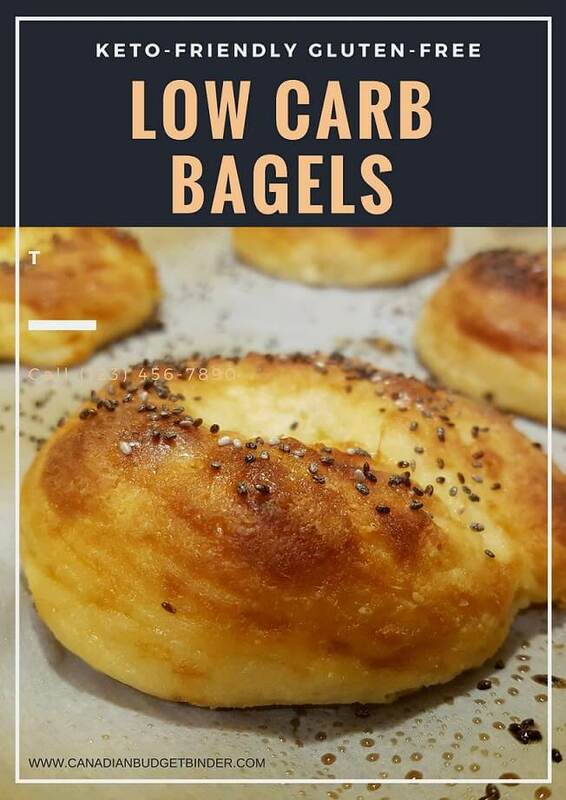 We actually had lots of fun making these and consider this recipe one of the best low carb bagel recipes thus far. Why are these gourmet low carb bagels? Why not? I can promise you that once you make this recipe for low carb bagels you won’t turn back. These low carb bagels are hand-made in your kitchen and anything that comes from a home chef is gourmet in my books. We’ve been searching for the best keto dough using almond flour that we could use for not just one recipe, but many. Generally speaking most dough recipes in the keto world are made with almond flour, coconut flour or a mixture of both. Some home chefs may add in other ingredients such as cauliflower, flax-seed, psyllium husk powder, protein powder to jazz up the fiber factor. Mrs. CBB and I have tried them all but just recently came across this amazing dough which we found at cookyscreations.blogspot.com which many low-carb foodies know as ‘Fat Head dough’ or ‘Fathead dough’. You can find a similar version based from cookyscreations over at the Fat Head movie blog called Faux Carb Pizza. Any time we’ve tested or created our own low carb dough for bagels, pretzels or pizza we were always met with the same results, crispy from the oven, dense when cold. If you want the best experience eating fat head dough of any description you must eat it hot from the oven. 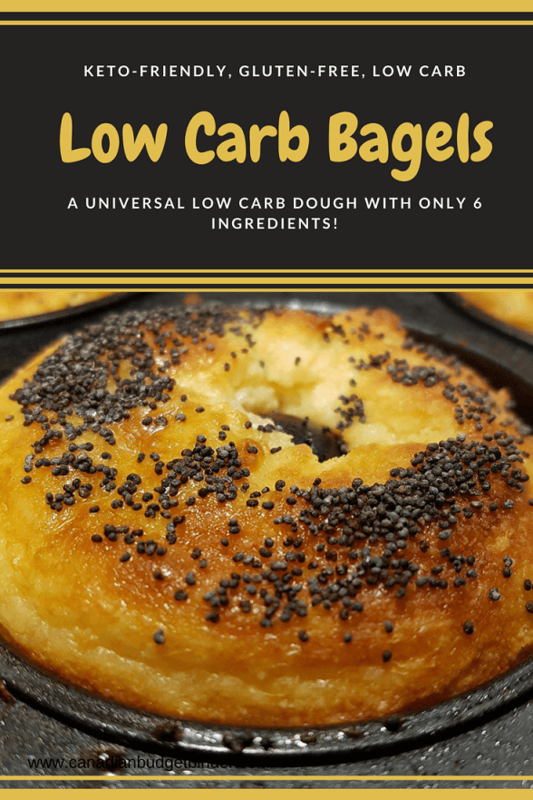 When you make an entire recipe of these low carb bagels what we’ve found is if you can’t toast the bagels where they become crispy you’ve got to try a new recipe. We’re confident you’ll love this one though. 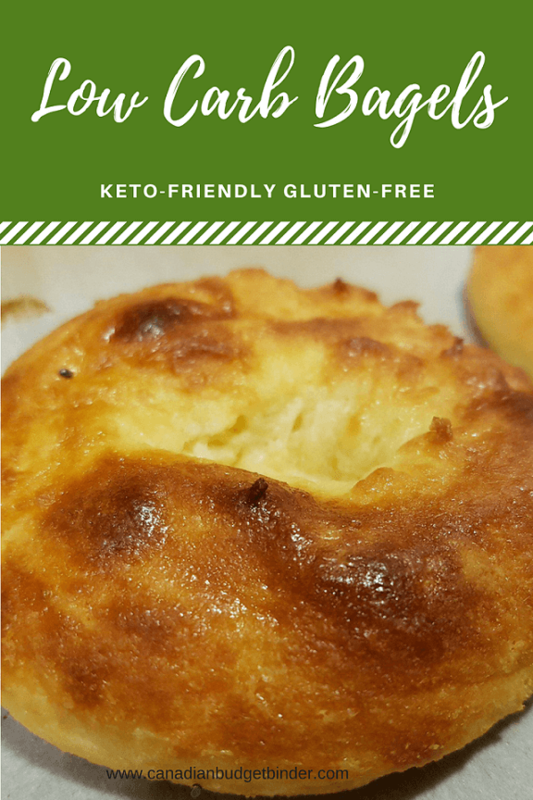 Although traditional fat head low carb pizza dough announced as the “Holy Grail” for the keto-lifestyle we tweaked the recipe three times in hopes of finding the fat head dough that would make the best low carb bagels. We’ve created recipes for all the above using our version of a fat head dough. 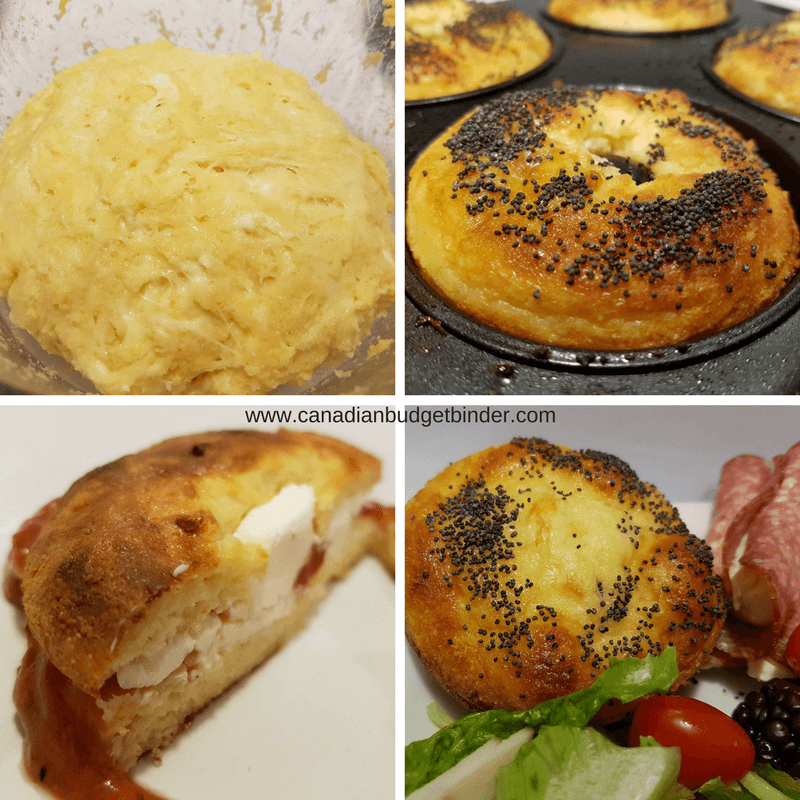 Once you have the base low carb dough for your keto bagels you can pretty much create any flavour bagel you like in keeping with a sugar-free, keto diet. Even if the keto lifestyle is not on your radar like myself (food tester) anything low carb is worth trying. I adore these low carb bagels any time of the day and I don’t get that heavy gluten feeling in my stomach when I’m finished like you would with traditional bagels. This is why I aim to cut back on the gluten and work to create alternative recipes for our family. Plain low carb bagels are best as you can add sweet or savoury to them which gives you options or make bagel sandwich. We’ve even made grilled cheese with a plain bagel! Oh Yes we Did. Poppy Seed low carb bagels are sprinkled liberally with poppy seeds before baking. Sesame low carb bagels – We bought Trader Joe’s Everything but the Bagel Sesame Seasoning Blend (Pack of 2) from Amazon Canada which you’ll only hear good things about as it’s delicious. Alternatively if you won’t want to purchase the seasoning you could sprinkle sesame seeds on top the bagels once baked. Our master low carb dough recipe offers less almond flour, more mozzarella cheese, Bob’s Red Mill Xanthan Gum and a couple of technique changes. Traditional bagels are boiled, seasoned then baked in the oven until golden brown. I’ve got it in my head to try this concept next with our keto dough to see if it holds up in the water before baking. For now this low carb dough recipe satisfies that bread craving. One of the changes we made to the original recipe was to lower the amount of almond flour in the recipe because we found some dough recipes we tested to be too dry. By eliminating some of the almond flour you also cut back on the amount of carbs. We also allowed the bagels to rest for 5 minutes before putting an egg white wash over before sprinkling our seasoning. You can find almond flour at Costco Canada for $17.99 for 1.36kg or another great brand is Yupik Almond Powder (Blanched), 1Kg . You can also find gluten-free Bob’s Red Mill Baking Powder, 453 gm to be reasonably priced online or in the shops. The best way to bake the bagels is on a pizza stone or on a parchment paper lined baking sheet. We also experimented making low carb bagels in a donut pan which turned out lovely and uniform. You don't have to go without bread for the rest of your life any longer. We've tweaked the original fat head pizza dough to create many varieties of bagels, pizza crust, cinnamon rolls and pretzels. 3 large eggs (separate whites and yolk of one egg and add extra yolk to the bowl with the 2 large eggs) The whites are for coating the top of the bagel before adding seasoning. Optional toppings: Sesame seeds, poppy seeds, cheese etc. In a medium bowl crack your eggs and beat them. In microwave safe medium sized bowl add the shredded mozzarella cheese and softened cream cheese cubes. Microwave the cheese mixture on high until melted completely about 2 minutes. Start by mixing the cheese up while it's hot and pouring it into the dry mixture bowl. It's important that you mix this dough thoroughly so you don't see any cream cheese blotches throughout. Let rest in the bowl for 5 minutes covered with a tea-towel and sat on your stove-top or counter-top where it's warm. Cut the dough into 6 triangles while inside the bowl. Take one ball of dough at a time, roll on your cutting board into a ball then stick your finger into the middle to make a hole. If you have a fancy tool to cut out the centre such as a cannoli tube or donut hole cutter that would work too. You can also roll the dough out and connect both ends into a circle with a hole. Brush each bagel one at a time with egg whites and dip or sprinkle your topping on top before baking. Set each bagel on your baking sheet or stone and bake for 10-12 mins at 400 degrees. Remove from oven and enjoy them hot or cold. If you don’t plan to eat your low carb bagels right away remember that the next day you will have to toast them if you want that crunchy exterior again. We toast them whole or you can cut them in half before toasting. They aren’t as thick as a traditional bagel once they’ve had time to cool fully but big enough to fit in a toaster. Either way these low carb bagels make a great snack and an even better sandwich loaded with your favourite toppings! Enjoy and tell me what you think of our recipe! Per 1 bagel : = 1.5 net carbs each. Used Atkins Carb Counter. Hi there. I made these last night and had one for breakfast – delish!! But, I entered all ingredients exactly into my Carb Manager and the net count is far more than your indicated 1.5 net carbs…mine indicates 5.8!! How can Atkins and Carb Manager be so varied? Thanks! These are amazing. Also made a batch with pepper jack cheese and it was so good. This recipe looks very good. I grew up in NYC, the bagel capital of the world. I miss the stretchy, airy inside and chewy outside of those water bathed bagels. Please let us know what happens with water bathing this dough. Thanks so much! I will for sure. We are going to be making them this week. 🙂 The pretzels we made are awesome and we dipped them in a water bath with baking soda.